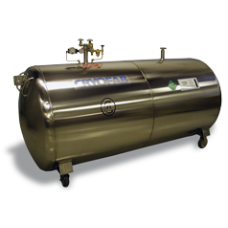 The horizontal cryogenic storage tanks/vessels in the CH Series are intended for low pressure transport and storage of liquid nitrogen, oxygen, and argon. These horizontal cryogenic storage tanks and vessels are designed to be conveniently accessible at lower heights, and are ideal for interaction with LN2 liquefiers. Casters are standard so the tank is easy to move in the lab or plant. A unique support system insures strength and durability without sacrificing thermal efficiency. Loss rates on this model have historically been lower than industrial products normally available. Sizes range from 300 liters to 2000 liters. The configuration of this vessel can vary significantly when options are added.